Finally got the time to take some pictures of Niniane which I bough few weeks ago. Manufactured by Kotobukiya, Niniane is based on an original drawing from famous Japanese illustrator Shunya Yamashita. It is made of porcelain and as with busts; it comes with no legs. The next series of pics are semi-NSFW and is somehow not recommended to be viewed at school or at work. Too bad her “eyes” are covered by her hair and sword. Metallic underwear. Reminds me of Princess Leia. This entry was posted in Figures, Photography. Bookmark the permalink. Wow.. 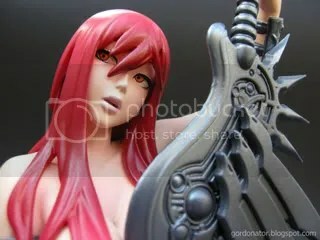 This is one sweet figure.. Like what lsio said, too bad theres no legs.. I love Shunya’s works but I’m not a fan of busts, if she was a complete figure I would probably get her. Not my kind of fig, I usually would go for those with more detail (and clothes lol) rather than sculpt. btw Gordon, what’s the code you’re using for the “read more” function? in that case u must love claymore then? i believe many share the same thought as u but i doubt there’ll be a full body PVC version. in that case the Chua Churam is right up your alley. Yo Gordon… Did you order the Karin bust also? That one is hot. Even without legs. @Gordon, Spot on. ^^; I think they should’ve included a variety of swords though..
yo welcome! i’m not ordering Karin. didn’t like the tattoo on her back. i like swords too. claymore and gundams with swords are my personal favourites. Oh Sweet, despite the lack of legs, those’re some deadly curves, and the metallic underwear really IS so princess-leia’ish. Although I think if I had this, my mom wouldn’t KILL me, I have liberal parents, lucky me ^^. i’ll wait for your e-mail. how do u know it won’t be able to get pass the customs? do u have similar experiences before?